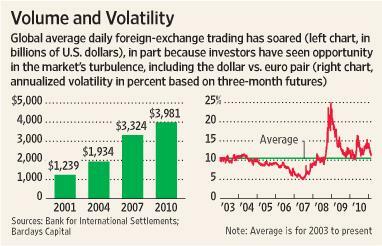 In the last month, volatility in the forex markets touched both a two-year low and a one-year high. 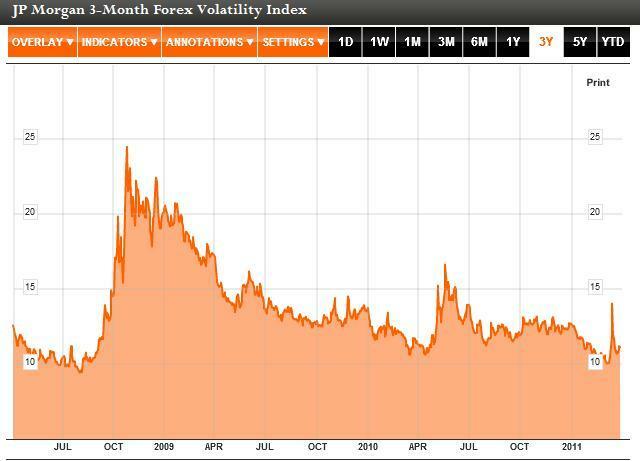 In the beginning of March, volatility essentially returned to pre-credit crisis levels. One week later, when the earthquake and inception of the nuclear crisis in Japan, volatility surged 40%. While it has since resumed its downward path, investors are still bracing themselves for continued uncertainty. The carry trade has perhaps born the brunt of the volatility spike. The carry trade depends on interest rate differentials – as opposed to currency appreciation – to drive profits, and thus demands stability. When the markets become choppy and exchange rates spike wildly in one direction or another, it makes the carry trade significantly more risky. Hence the paradoxical rise of the Japanese Yen to a record high following a series of crushing disasters, as highly leveraged traders moved to unwind their Yen-short carry trades. Likewise, high volatility should spur demand for so-called safe haven currencies. If only it were clear what constitutes a safe haven currency. Traditionally, that would send the US Dollar, Swiss Franc, and Japanese Yen upwards. In this case, the Franc has benefited most, followed closely by the Yen. The Dollar spiked against emerging market and high-risk currencies, but hardly budged against its G4 counterparts. Could it be that the Dollar’s multi-year positive correlation with volatility has (temporarily?) abated. With regard to strategy, currency traders have a handful of choices. If you believe that volatility will continue declining or remain stable, you’re probably going to go long emerging market and high-yielding currencies, and short one of the safe-haven currencies, all of which are quite cheap to borrow. The main risk of such a strategy, of course, is that volatility will once again spike, in which these safe have currencies will rally. If you think that the ebb and volatility isn’t sustainable, then you’re probably going to bet on the Franc, Dollar, or Yen. As I wrote in an earlier post, I think the Yen could theoretically appreciate in the short-term, but actually remains quite risky over the long-term. Despite the best efforts of the Swiss National Bank, the Franc will probably continue appreciation. Economically and monetarily, it is in an excellent shape. Besides, the fact that the supply of Francs is intrinsically small means that even modest capital inflow often translates into a big jump in its its value. As for the Dollar, it is now the most popular currency to short. It remains a safe choice and a good store of value, but probably won’t deliver the returns that safe-haven strategists have come to expect. From a practical standpoint, you may also want to consider reducing your leverage. As everyone knows, high leverage increases profits but also magnifies losses. In the current environment of heightened volatility, leverage also magnifies risk. Either way, you may also want to consider hedging your exposure, by trading a basket of currencies and/or through the use of options. The Suisse Franc seems to be best fit to benefit from the global turmoil. The argument regarding correlation between Volatility and currency pairs is very interesting. I’ve checked the correlation between USD/CHF and the SP 500 3 Months Vol. Over the last year, the highest level was measured on April 26th 0.29 while the correlation broker and is now standing at -0.02. We have to mention that overall the SP 500 3M Vol is relatively low (17.7, whilst the Average of last five years is around 27%). Out of curiosity, I’ve also checked the correlation between USD/CHF and the Brent Future and the results were almost identical.